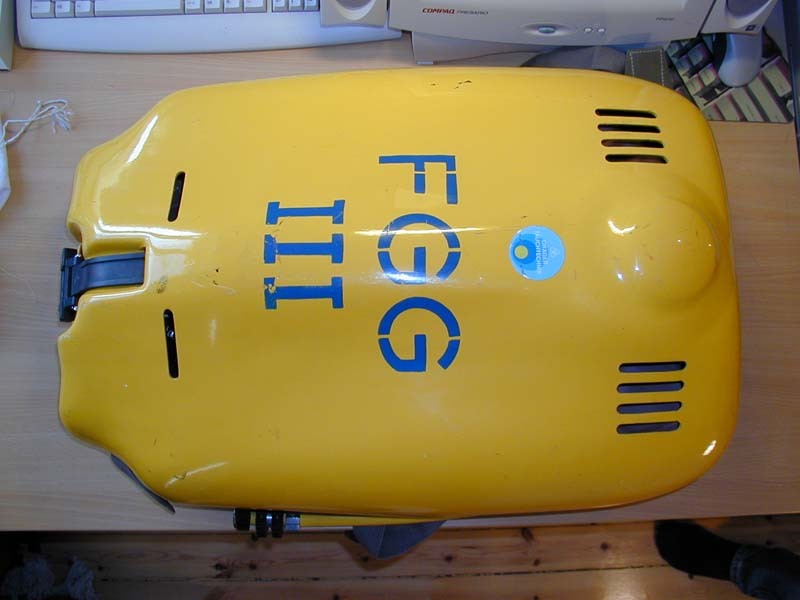 The Draeger FertiggasGemishGeräte III, (pre-mixed gas unit III) also known as the FGG III is a late 1960's rebreather design. FGG III is a semi closed constant massflow device very similar to the Drager FGT as well as the Draeger Dolphin and Ray. The unit is made for self-contained short duration deep diving down to 200m. 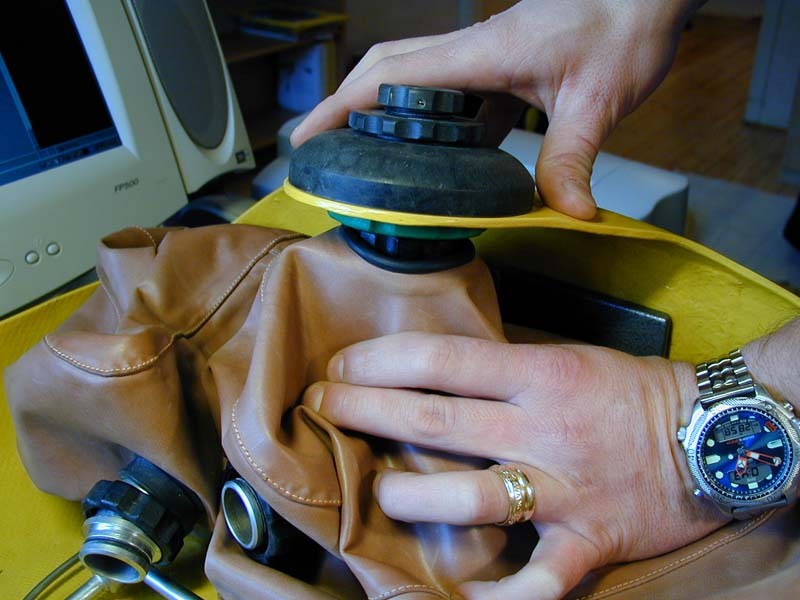 To allow longer diving times the unit is equipped with a connector for external gas supply. 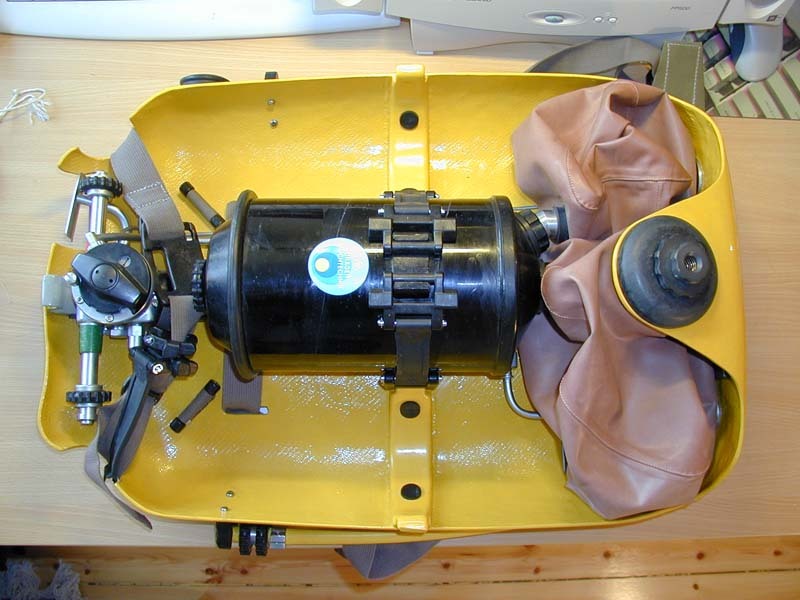 The unit is intended to be used from a diving chamber or a submarine. 0 - 60m ca 60 mix "0"
The mix "0" is run through the mix "III" flow setting valve position. The on board tanks (2 * 4L steel) are filled with a one of the above mixes and a selector valve on the regulator/ dosage unit is set to one of the mixes "I" to "III". The flow controlling orifices are fixed and thus not adjustable. The FGG has a 40 bar intermediate pressure to ensure critical flow over the orifices at all depths (see the flow theory pages). 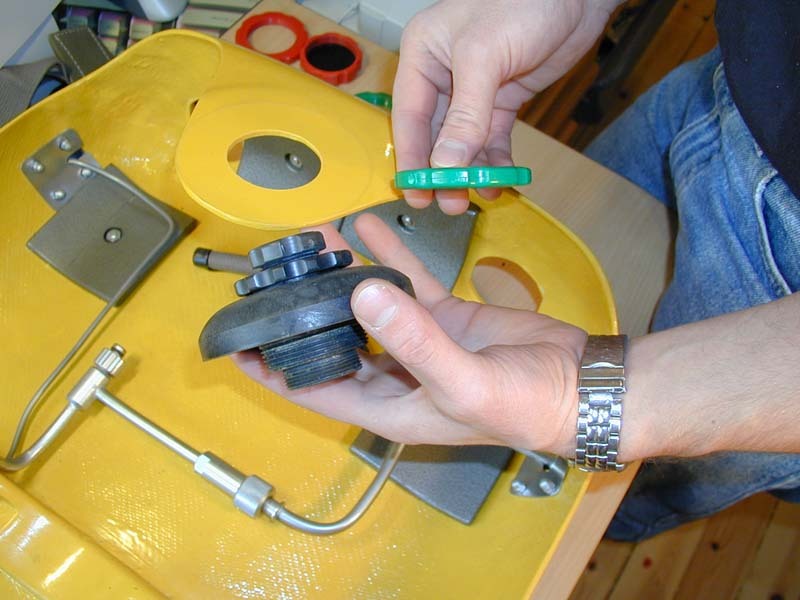 Worth to note is that all connectors can be removed without any tools, all have radial O- ring seals except the tank fitting. For more information on the older Draeger devices try to find the excellent book - "Tauchtechnik" by Gerhard Haux, Springer Verlag 1969, Library of congres no: 79-99015. The book is in German. The figures in the table above originate from the FGG service manual (thanks Jason M in Oz) and differ slightly from those found in "Tauchtechnik"
The unit shown on the pictures below has never been dived and IS NO LONGER FOR SALE. The seller made up his mind to keep this piece of unique diving gear! The unit with cover on. A rubber strap hold the cover in place. 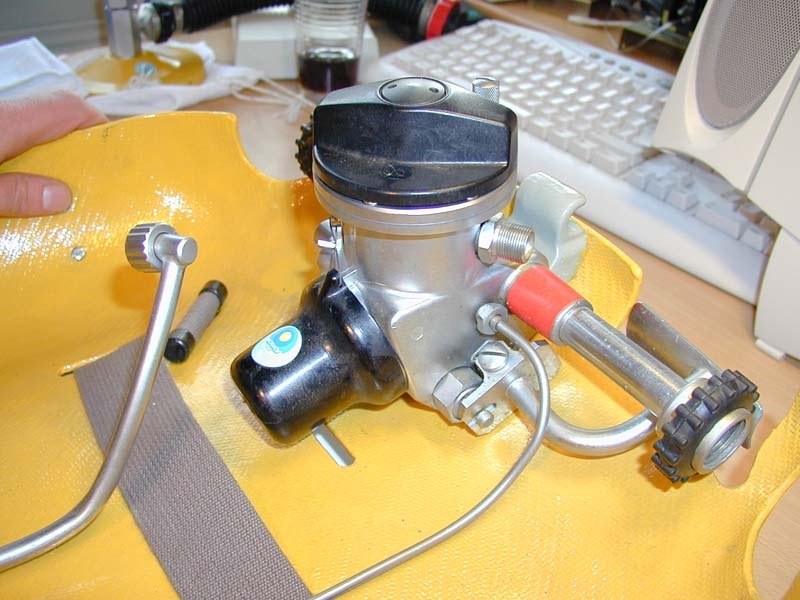 The yellow hose with a black rubber knob on the right side of the unit is the off-board gas connector. The off- board connector feeds directly into the fresh gas line into the circuit thus making it possible to control the fresh gas flow (and mix) externally. See also picture below. The unit seen from the top. 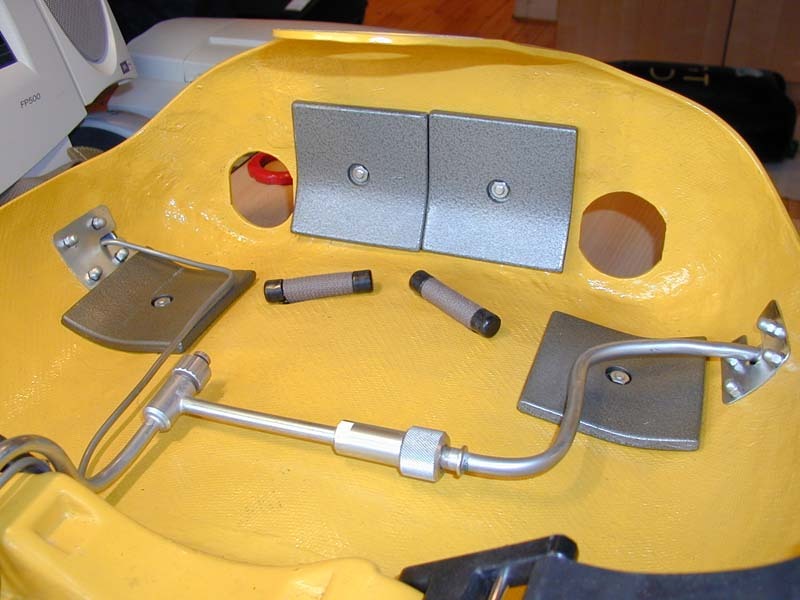 The yellow hose to the left is the off-board gas supply connector. 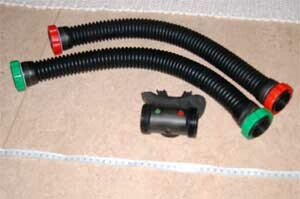 The breathing hose connectors are colour coded and do also have different threads. The protective caps have the wrong colour though. Two rather crappy pictures of the DSV and hoses of the FGG / FGT. 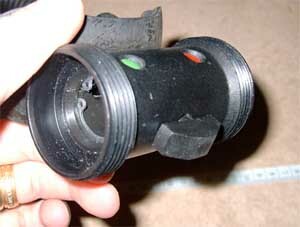 The non-return valves are housed in the hoses. 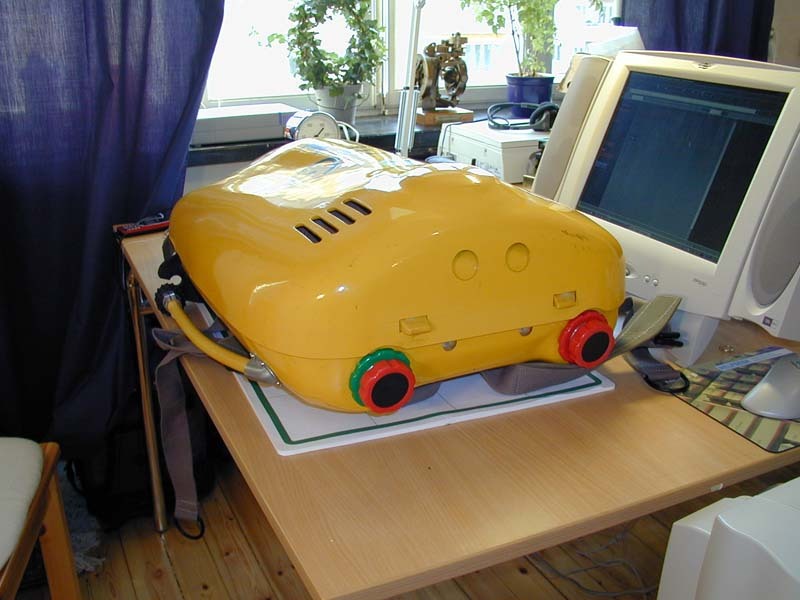 The DSV is very similar to the one found on the Draeger Ray. The threads and connection sizes are different thus makin mis-connection impossible also for the colour vlind. The rubber straps that hold the tanks are missing but are similar to the one holding the upper cover. 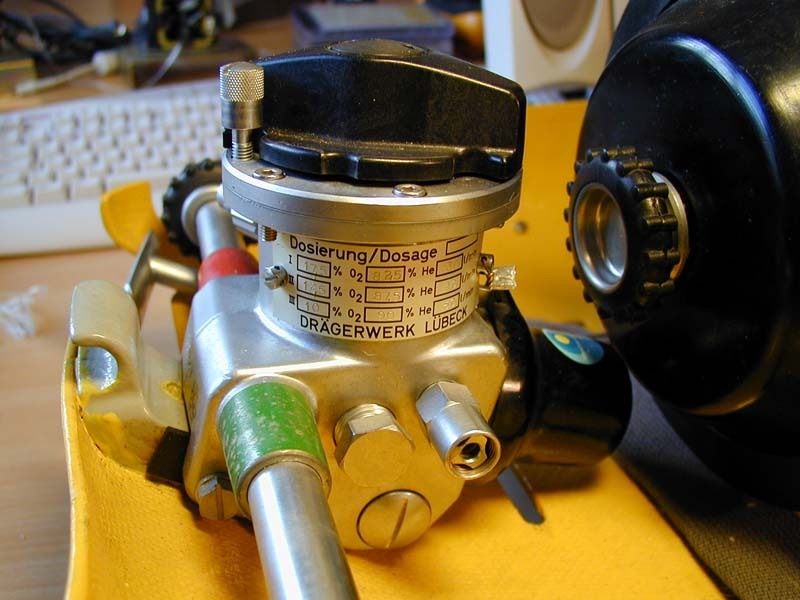 Regulator and with dosage selector valve. Note the selection locking bolt and the intermediate pressure over pressure relief valve. Also seen to the right is the screw that closes the canister. The other side of the regulator with bypass valve (under the tank connector), HP line to pressure gauge, and dosage line (disconnected). Inside of the canister, After 1 use it no longer shines! Exhaled gas flows down in the inner tube, turns upward through the mesh and then through the lime and into the inhalation bag. The canister has an axial flow path. 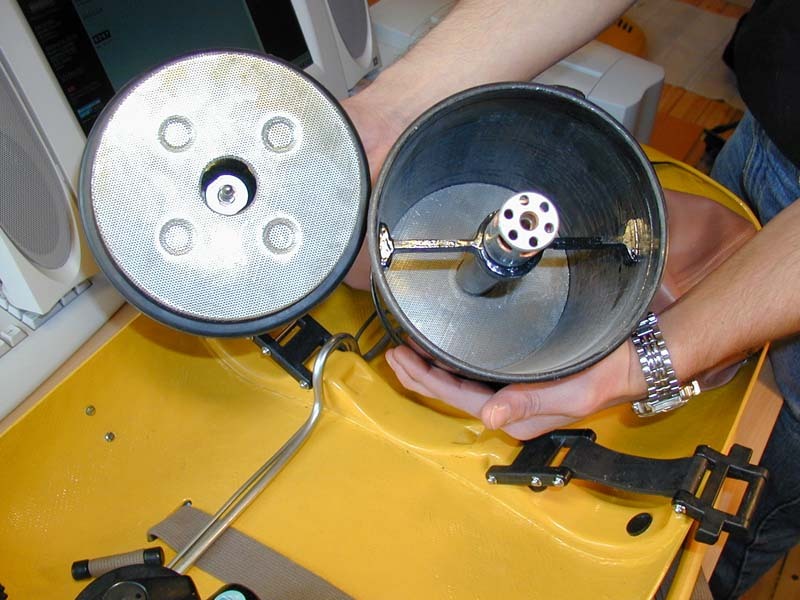 Inhalation bag (top) and exhalation bag (bottom) connectors to the canister. Also seen is the fresh gas supply coming from the on-board tanks from the left and the off-board via a non-return valve from the lower right. The off board gas supply is a low pressure feed. The over pressure dump valve is connected to the exhalation bag. It is adjustable between 7 and 11 cmH2O. The connection between the exhalation bag and the canister holds a water trap, a 10 cm tube located inside the bag. Thread for connection to exhalation bag. The almost bare lower shell which is made from glassfibre reinforced epoxy. To the left the HP lines exits the shell to the pressure gauge. Balancing weights, 4 *1 kg are mounted around the bags. The harness shoulder straps are fed through the shell and secured with a plastic pin. 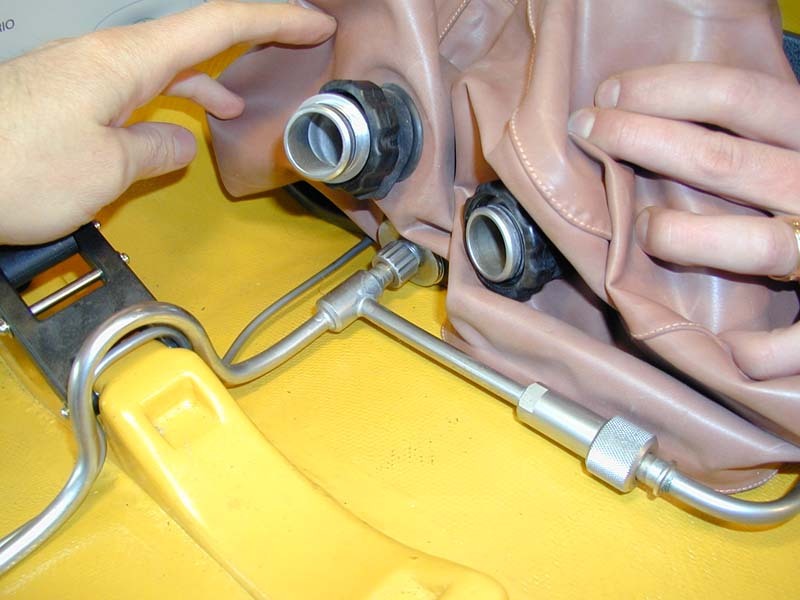 The off-board gas line exits into the yellow hose with black knob seen in pictures above.